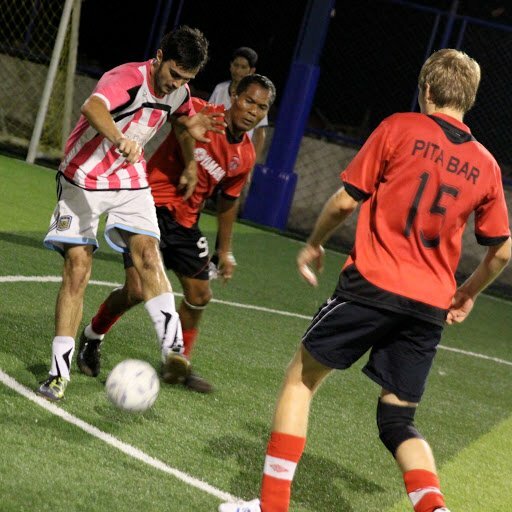 SUPER SIX: The third season of Phuket’s Super Six soccer competition wrapped up with a handful of games, with Morning Star taking the first division honours and the second division’s Pita Bar Phuketeers and Puensil FC winning promotion into the top ranks for next season. Second division winners Pita Bar Phuketeers head off Phuket Serenity Villas in the last games of the Phuket Super Six league’s third season. Morning Star had already secured the division 1 title when they came up for their last game against Phuket Condos & Homes, but there was prestige at stake: PC&H had won five of their last six games. Morning Star fired up at their usual high pace, and were 2-1 up at the break. PC&H pressed for an equaliser after half time, but found it hard to get though Morning Star’s defence. Instead, Morning Star picked another few goals, while PC&H only picked up one, for a final score of 4-2. The game between the The Hulk and Sweet Lemon FC ended with a five-all draw and a sharing of the spoils for these two highly skilled Thai teams. Next up, Joy Dive needed a win against PSU Alumni to secure second place in division 1. PSU scored the first goal in the game, and kept Joy Dive at bay until only five minutes remained, when Joy Dive finally got their equaliser. In the dying minutes they added another to make it 2-1 and give them all 3 points and the second spot in division 1. With a win in their final game, Shakers were looking to put the pressure on for the second spot. It was a relatively easy win for Shakers, who scored 11 goals against the Boys from Nanai and conceded only 3. In Division 2, Pluto Italian Ice Cream beat Puensil FC by 11 goals to 8 – the surprise of the day, with Pluto snatching all 3 points against Puensil, who still remain second on the table and ready for promotion into division 1. Other games in this division saw Shambhala FC draw with Seduction at 5 goals each, and Pita Bar Phuketeers consolidated their top position in division 1 with a 5-1 win against 3rd spot Phuket Serenity Villas. Mr Moo inflicted a massive 10-0 victory on Bat Fire FC in the final game, securing the fourth sport in the division table. Phuket’s Super Six League season 4 is set to start on January 8 for division 2 and January 9 for division 1. The league is now now accepting teams for the new season, and interested players can contact Karl Ward for more information: email karl@phuketfootball.com or call 085 585 1133.